This picture is for my friend Sergio. And yes, I have a friend named Sergio. Of course, the million dollar question is: Who were they talking about?!?! 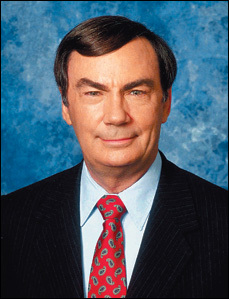 If you guessed D) Sam Donaldson, then you A) clearly don't understand how to answer questions and B) totally underestimate the power of hard-hitting journalism combined with a strong part in your hair. Sammi Sweetheart is indeed creeping up on Ashley Holmes from Real Housewives of the Armpit of the East Coast as the world's worst person. Her display during last Sundee's episode was straight-up embarrassing. For those of you who may have missed it (AND IF THAT'S YOU, CAN I PLEASE PLEASE PLEASE COME LIVE WITH YOU? ), Sammi gave Ronnie back a bunch of presents that he had given her earlier that week to show him that his gifts didn't mean jack to her. "I'm done with this. Done!" So when Ronnie found the gifts (conveniently returned on his bed) he threw them all in the trash. When Sammi realized Ronnie was trashing them, she started fishing 'em out of the garbage and took them back - totally contradicting her initial point and proving that one lady's trash is another man's trash, and that trash is actually the first lady's treasure, but really that lady is hardly a lady in the first place, despite the fact that she sometimes looks kinda hot and I'm sorry, I really am, but she does sometimes look kinda hot. IN HER DEFENSE THOUGH, I will say that Sammi Sweetheart has ABSOLUTELY ZERO nose hair, which is nice for her. I am honestly baffled when human beings have smooth inner nostrils, possibly because every time I look in the mirror I find my nose hair sprouting in every conceivable direction. I also sometimes find hairs sticking out of my ear lobe (not the inner ear, but the actual ear LOBE) which is both depressing and kind-of gully. 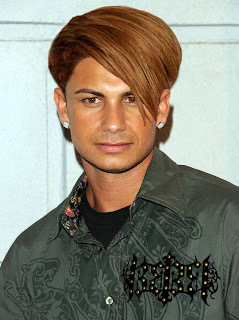 DJ Pauly D's hair never sprouts anywhere (actually, it's just like one huge sprout) and is a major part of his persona, but let's be honest for a second, the guy needs a new hairstyle. That blowout is just not a man's haircut, it's a little boy's cut. Don't get me wrong, I love Pauly D, and the blowout served its purpose by putting him on the map, but it's time for him to switch it up. It would do wonders for his future in reality television and hosting club nights at Harrah's pool. 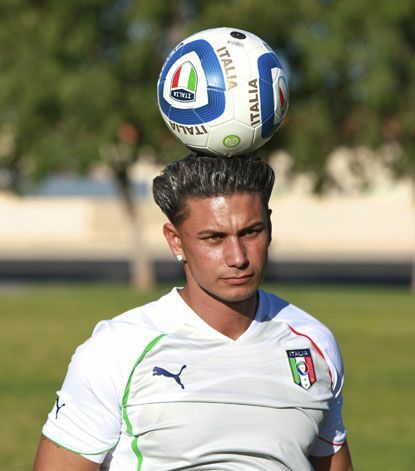 Also, does anyone know what the "D" in Pauly D stands for? How ya doing, my name's Paul Donaldson, I'm here for the DJ tryouts. Is that a Batman lapel? My friend Sergio is opening a men's hair salon called "I'm Sergio" and I'm not making this up. Check out his website here. You can also follow I'm Sergio on Twitter. And me too. Or you could look at these pictures from the world's biggest tomato flight. I think he would lose his identity if he changed up the hairstyle. He has no other real talent. It's nice to know when I post a link to this blog on my blog, my readers get to enjoy the phrase "Makes Me Want to Take a Wrench and Wrench My Own Balls" for as many days as it takes you to write the next points.